I made mine last night, so it still has to steep for two weeks before use. Oil of oregano was brought to my attention recently by a friend of mine. 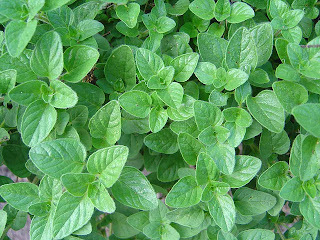 Oil of oregano comes from the leaves and flowers. She uses it to ward off colds and soothe sore throats, among other things. I thought it warranted investigation, especially because it can be a little on the expensive side when purchased at a health food store. Oregano (Origanum vulgare), is the cooking herb we all know so well from Middle Eastern, Greek and Italian food. It’s sometimes called the “pizza” herb. It is native to the warmer areas of Eurasia and the Mediterranean. In those areas it is a perennial that can grow as high as 20 inches, if given the right conditions. Those conditions are plenty of sun and soil that’s a little on the alkaline side, but it will grow in less than optimal conditions. The variety we purchase at the grocery store is O. vulgare, but sources say that other varieties are more superior in taste, with more pungency and spiciness. So if you’re looking to plant from seed, maybe try a different variety. Oregano has a long history as a medicinal herb. The ancient Greeks used oregano as an antiseptic, as well as a cure for stomach and respiratory ailments. Oregano is high in antioxidants, due to a concentration of phenolic acids and flavonoids. It also has shown some potential antimicrobial activity against strains of the food-borne Listeria monocytogenes. These claims have not been completely verified by scientific studies.In fact, in 2005 the US Federal Trade Commission sued a firm advertising their oil of oregano for an effective treatment for colds, flu and viral infections. In their suit the USFTC claimed the statements were false and/or misleading. Their contention was there was insufficient scientific study to back up health claims. The following information about the potential health benefits of oil of oregano is from a book called “The Cure is in the Cupboard,” by Cass Ingram, MD. I don't seem to be able to find any scientific websites to back up the claims in the book. The only sources citing health benefits of oil of oregano are naturopathic. That doesn't make the information wrong, just perhaps not a scientifically verified as one would hope for the significant benefits claimed. In it are made several interesting statements. Oil of oregano is contains a powerful phenol, carvacrol, that makes it a topical antiseptic and antiviral. It is supposed to aid in the treatment of acne, cold sores and slight fungal infections. Oil of oregano is also supposed to aid in warding off colds and flu due to antiviral properties that stimulate the production of white blood cells. It supposedly can also alleviate annoying cold symptoms, particularly congestion, sore throats, coughs and runny noses. Oil of oregano is also supposed to have anti-inflammatory properties that make it a candidate to treat arthritis and headaches. It also may have the ability to aid digestion and intestinal health through the carvacol and thymol present in the oil. It's as easy as heating oil with the bruised herb. Most benefits seem to be anecdotal, as protested by the USFTC, and it has yet to be borne out by rigorous scientific study. At the very least it can’t hurt… Ancient peoples found it useful, and tasty. It must be noted that some people have adverses gastric and allergic reactions to oil of oregano. We seem to be so enamoured now with synthetic medicines we often forget that most have their roots in natural sources. The Greeks still use a strain of oregano to homoeopathically treat sore throats today. Oil of oregano is an interesting cooking ingredient, imparting a strong oregano flavour to any foods fried or sautéed in it. If you make it at home it’s also cost-efficient. I most probably will try this with other oils. Anyone up for pork chops browned in sage oil? 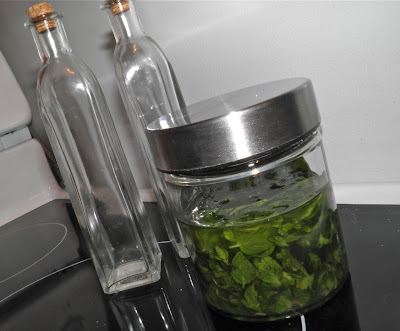 To make your own at home is very easy, but it does take two weeks.Total cost to make about 1 cup was $2.50 for the oregano and about 75¢ for the grapeseed oil, if that much. 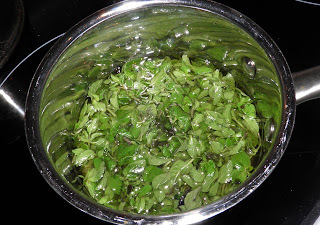 Remove the oregano leaves from the stems. Measure to see how much you have. Place in a pot and muddle well with a blunt object like a soon handle or similar tool (like a pestle). Add an equal amount of grapeseed oil and heat gently just until the oil is almost too hot to put a (very clean) finger in. Don't let the oil get hot – just very warm. You don’t want to fry the oregano. Place in a very clean jar with a well fitting lid and let steep for two weeks. Over that time the oil should take on a slight green tinge as the essential oil excretes from the leaves. Strain out the leaves. Decant into a bottle and use either for the above health benefits or as a cooking oil.